When he was eight years old, Bennie Mols (1969) wanted to become a professor. He failed. Instead, he became a science journalist, science writer and science communicator. He holds master degrees in physics (TUE) and philosophy (UvA), as well as a Ph.D.-degree in physics (TUD, 1999). He never stops wondering about science in general and physics, computer science, mathematics, neuroscience and psychology in particular. And he tries to make a living by sharing the fruits of his wondering with a broad audience. Bennie Mols wrote more than four hundred popular science-articles for, among others, NRC Handelsblad, NWT Magazine, KIJK, Intermediair and De Ingenieur. He published several books and has participated as a speaker in more than two hundred radio broadcasts explaining science to a broad audience. 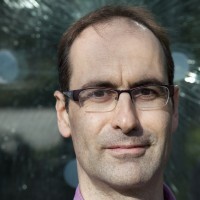 Earlier this year he published his latest popular-science book: ‘Turings Tango − Waarom de mens de computer de baas blijft’, about the quest to build thinking machines. The book combines the latests insights in artificial intelligence with those from the brain- and cognition sciences and philosophy. Turings Tango also honors the birth of computer pioneer Alan Turing exactly one hundred years ago. Mols loves artificial intelligence, but argues that artificial intelligence will always remain different from human intelligence (and that there is nothing wrong with that). It’s the biology stupid!